Seeing the writing on the wall, Becket fled to France where he remained in exile for six years. The two former friends appeared to resolve their dispute in 1170 when King Henry and Becket met in Normandy. On November 30, Becket crossed the Channel returning to his post at Canterbury. 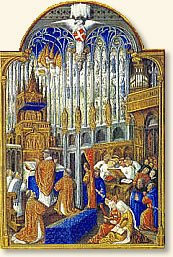 Earlier, while in France, Becket had excomunicated the Bishops of London and Salisbury for their support of the king. 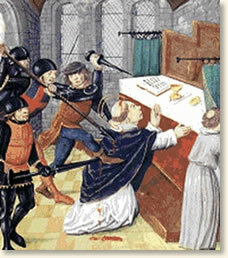 Now, Becket remained steadfast in his refusal to absolve the bishops. This news threw King Henry (still in France) into a rage in which he was purported to shout: "What sluggards, what cowards have I brought up in my court, who care nothing for their allegiance to their lord. Who will rid me of this meddlesome priest." Becket did not want the job. As chancellor, he was as powerful as he wished to be. He also had an excellent relationship with Henry, and he did not want to spoil this. In fact, on being offered the post, Becket wrote to Henry that “ourfriendship will turn to hate.” However, Henry persuaded Becket and he agreed in 1162 to the appointment. His letter was indeed to become prophetic.